Take an intimate journey with an award-winning wildlife photographer as he observes the trials and joys of this charismatic creature through the lens of his camera. 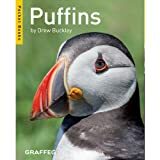 Featuring stunning photography, Puffins provides an amusing insight into the daily struggles of this tenacious little bird. Drew Buckley is a landscape and wildlife photographer. A frequent contributor to a established wildlife and photography magazines, he is a lover of all things outdoors and is regularly nominated for photography awards.